Yvonne van der Mey, wildlife photographer, was selected on the 2nd of May in Paris (France) as one of six award-winning photographers in an international photo competition. The contest was organised by CIC International Wildlife Organisation. The title of the competition was “Mammal predators in their habitats”. 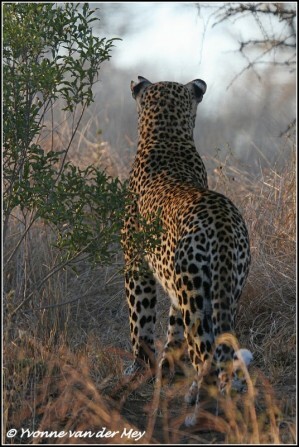 Three of Yvonne’s photographs were nominated, and her leopard photograph was awarded with the Beauty Prize. She was the only Dutch photographer and the only female photographer who was awarded a prize. The other five winning photographers were from Switzerland, Poland, China, Belgium and Finland. Yvonne van der Mey is well known for her spectacular photographs of African nature and wildlife. She lives in a wildlife reserve in the Netherlands for almost 25 years now, where she works most of the year. But several months a year she wonders through the African continent, accompanied by her husband Nico Bulder and their son Kevin. Wherever she works, she is always looking for those special moments that show off nature and wildlife in its own, unique way. In the Netherlands she finds a lot of inspiration as well. Since 2008 she has been working intensively with people, trying to help them experience nature in the same way that she does on a daily basis. She organises workshops and courses for that goal. Her passion about nature and wildlife is an inspiration to a lot of people, who learn how to “see” nature differently, instead of just looking at it. Hundreds of photographs from all over the world were entered into the photo competition in January 2009, and only 40 of them were nominated for the final judgement (three photographs by Yvonne and two by her son Kevin were nominated). The nominated photographs were exhibited in Paris and on the 2nd of May, the winning photographers were announced during the closing session of the 56th CIC General Assembly. The award-winning photograph by Yvonne is one of a series of 25 photographs that she took of a male leopard. She found him early in the morning in the dense African bush. He showed all the signs of being “a man in love”, desperately trying to take in the scent of a female. In the winning photograph, she captured him while he was staring into the distance. The jury was impressed by the creativity in composition and tension of the photograph. It feels as if the viewer is being drawn into the world of the leopard.